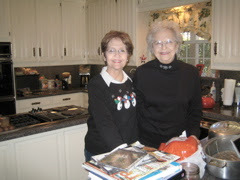 Nancy's Nook : My mother and me . . .
My mother and me . . . While the guys are away, the girls will play. . . and that's what we've been doing. And it's been fun. I can't wait till the guys get home, though. I MEAN, I CANNOT WAIT. They will have tales to tell and I CANNOT WAIT to hear them. Then in about 2 months darling Laura will come home and tell her tales. Oh my. I may have to stay up late. World travelers we all have been. I do live a dream life. sounds like a lot of fun! and i did get the pictures yzou sent me. for some reason this computer wont let me email people (im stillin switzerland). but i loved them! Hmm, Brio two times in one week. Did you get the lasagna again? You should really venture out. That chicken dish was quite good. Aww! Two of my favorite people. It sounds like you've been having a good time! mm jw! Check your e-mail. I sent you a long one. The ants go marching . . .
A clean house . . . Still quiet . . .
All is quiet . . .
Banda Aceh, Indonesia . . .
Bad Dog . . .
She'll be close to me again!